35% of Homeowners Don’t Know Their Own Mortgage Rate? A new survey from Bankrate revealed that 35% of homeowners with a mortgage don’t even know what their interest rate is. Or at best they’re somewhere between “somewhat confident and not all confident” about what that rate is. Conversely, 65% of respondents indicated that they were “very confident” that they knew what their interest rate was. However, it could be even worse than it looks. A mortgage planner interviewed for the Bankrate’s Money Pulse survey said homeowners often think they know what their rate is, but turn out to be wrong. Instead, they only seem to know that their interest rate is within a certain range, such as 4-4.5%. Part of this may have to do with the APR, which is a different, higher figure in most cases. There’s also the mound of paperwork involved with a mortgage that might force borrowers to stick their heads in the sand and just forget it about it entirely. Interestingly, wealthier borrowers seem to be more confident about knowing their mortgage rate. 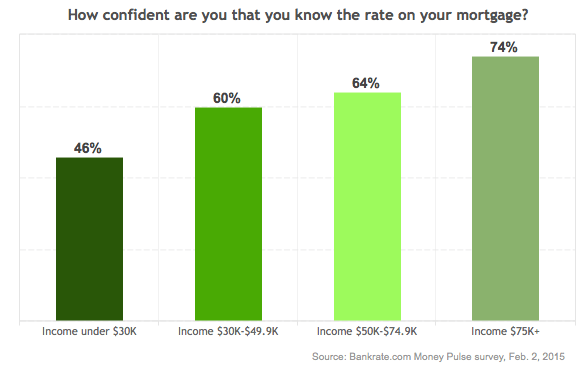 In fact, as income rises, so too does confidence about knowing one’s rate. The opposite is also clearly true. Perhaps those with more money are more sophisticated when it comes to finances, though everyone should be able to take note of (and remember) the interest rate they receive on their mortgage. If you don’t, you could miss out on a money-saving refinance opportunity. And if you really don’t know, you could just wind up with a bad deal on your home loan to begin with. Your interest rate does matter, a lot. For example, a $200,000 loan amount with a rate of 4.25% will set you back about $983 a month. If the rate on the same loan is 4.5%, the monthly payment is only about $20 higher, but costs more than $10,000 throughout the life of the loan thanks to interest. So as inconsequential as it may seem, it does pay to know your exact interest rate. Consumers Don’t Care About Mortgage Rates? While the math tells us we should care, many apparently do not. The Bankrate survey also found that consumers are happy to buy rather than rent, even if interest rates surge. 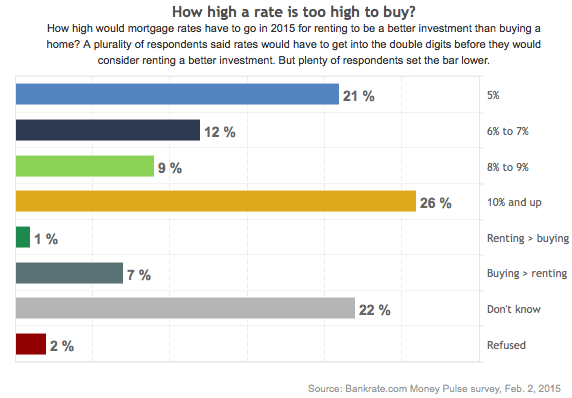 Of the respondents who answered the question about how high the 30-year fixed would need to climb before they’d consider renting a better option, 26% said 10% and up. Currently, the 30-year fixed is around 3.65%, so it would have to nearly triple before most respondents felt a home purchase was out of the question. Of course, many who don’t seem to mind a higher mortgage rate may not realize that they’ll have trouble qualifying for a mortgage at such a high rate of interest. But that’s another story. The key takeaway here is that you should always know what your mortgage rate is and do your best to secure the lowest one possible (costs being equal) when you first purchase a home. And keep an eye on rates if they fall enough to warrant a rate and term refinance. After all, a tiny difference could cost you a lot of money over time, so giving it some of your hard-earned attention might be advisable. Read more: 10 tips when mortgage rate shopping.